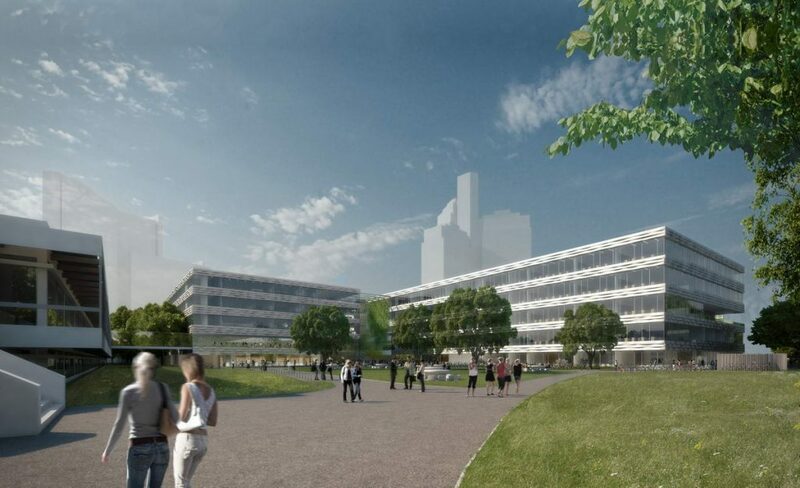 The new building for the Department of Chemistry and the Didactics of the Natural Sciences is divided into two blocks that are naturally integrated into the surroundings, because the adjacent Cologne green belt is continued as a green link. Beginning at the common core, the greenery extends past the entrance area into the gap. Student workplaces are arranged as green oases in the internal courtyards. They provide ample opportunities for study, scientific exchange and communication. Playfully arranged galleries at different locations constantly offer new views between the floors. In addition, the internal courtyards – designed as glazed atria – provide many energy benefits and promote an excellent indoor climate. The internal organisation of the building follows a clearly structured and yet very flexible floor plan concept, especially with regard to later conversions. By analogy with the concrete lamella of the existing building, the elevation is implemented as a strip façade with wound aluminium panels. The building’s internal organisation is also reflected in the façade. In the laboratory areas, the façade is executed with large areas of glazing that ensure optimal natural lighting.